Read It Later - A Firefox add-on lets you save pages for later reading ~ Android Forever! "This Firefox extension allows you to save pages of interest to read later. 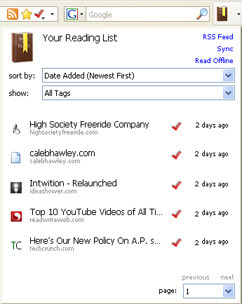 It eliminates cluttering of bookmarks with sites that are merely of a one-time interest. A commenter below (Chris) summed it up very well: 'It’s a ’staging area’ for bookmarks.'"